Tramite la fascia connettivale, i muscoli sono in realtà strutturati in lunghe catene muscolari o meglio miofasciali. La lunghezza (l’elasticità) di ogni singolo muscolo è strettamente legata a quella di tutti i muscoli appartenenti alla stessa catena. Occorre comunque sempre tener presente la stretta integrazione esistente all’interno del sistema miofasciale e del nostro organismo; è difficile isolare funzionalmente un organo o una struttura. Un gruppo di muscoli in tensione esercita un’influenza su gli altri muscoli vicini, sia per un fattore fisico-fasciale che nervoso (i neuroni eccitati eccitano quelli vicini). trapezio, gran dorsale, romboidei, elevatore della scapola, dentati (serratus), erettore della colonna, trasverso spinoso, interspinosi e intertrasversi, semimembranoso, semitendinoso, gracile, bicipite femorale, adduttori, plantare, popliteo, gemelli (grastrocnemio), soleo, tibiale posteriore, flessori lunghi delle dita e plantari del piede. 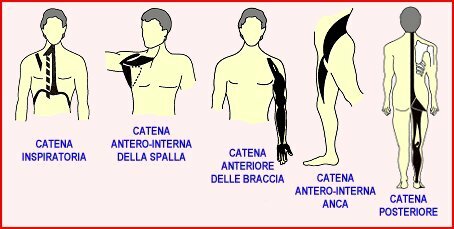 La catena muscolare antero-inferiore (fascia cervico-toraco-addomino-pelvica) è formata dal tendine centrale, dal diaframma, dall’ileopsoas e dalla fascia iliaca. La catena muscolare inspiratoria è formata dai muscoli nucali piccolo e grande retto posteriore, dal lunghissimo di capo e collo e dal tendine centrale che collega il rachide cervicale al diaframma e all’asse viscerale. La catena muscolare anteriore del baccio è composta dal muscolo coraco-brachiale, dal bicipite, dal brachiale, dal brachio-radiale, dal lungo supinatore, da tutti i muscoli flessori e pronatori dell’avambraccio compresi i muscoli dell’eminenza tenar e ipotenar. Il principio cardine di questa metodica è che i muscoli statici più rimangono accorciati (in contrazione) più diventano retratti e resistenti all’allungamento, mentre quelli dinamici possono essere accorciati (contratti) liberamente e favoriti in questo da un pre-allungamento. Ne deriva che i muscoli statici andranno esercitati in modo eccentrico e quelli dinamici in modo concentrico. Superando i limiti della disciplina Mézières, Souchard pone inoltre particolare attenzione al muscolo respiratorio diaframma e al nervo fibroso che lo sostiene, nonché alla sua azione sinergica con i muscoli posteriori e psoas. Souchard ritiene che le catene muscolari della statica siano prevalentemente due: anteriore e posteriore. a) La catena inspiratoria, formata dai seguenti muscoli: diaframma con il suo tendine sospensore, scaleni, gran dentato, sternocleidomastoidei e piccolo pettorale. b) La catena antero-interna della spalla, formata dai seguenti muscoli: sottoscapolare, parte superiore del gran pettorale e coracobrachiale. 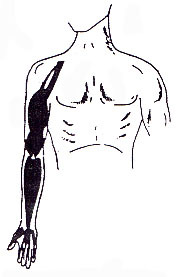 c) La catena anteriore del braccio, formata dai seguenti muscoli: bicipite, brachiale anteriore, coracobrachiale, lungo-supinatore, grande e piccolo palmare e dai muscoli dell’eminenza thenar ed ipothenar. d) La catena antero-interna dell’anca, formata dai muscoli ileo-psoas e dai muscoli adduttori pubici. e) spinali, grande gluteo, pelvi-trocanteri, ischio-tibiali, popliteo, soleo e plantari. Souchard individua prevalentemente due quadri morfologici. Il primo è detto anteriore; i pazienti appartenenti a questa categoria possono presentare prevalentemente queste caratteristiche: testa in avanti, ipercifosi, iperlordosi, bacino antiverso, femore intraruotato e ginocchia valghe, calcagno e piede valgo. Il secondo è detto posteriore; i pazienti appartenenti a questa categoria possono presentare prevalentemente queste caratteristiche: nuca corta, dorso piatto, ipolordosi lombare e diaframmatica, bacino retroverso, ginocchia vare, calcagno e piede varo. 1) Posture con l’apertura dell’angolo coxo-femorale per agire sulla catena anteriore. 2) Posture con chiusura dell’angolo coxo-femorale per agire sulla catena posteriore. Entrambe possono essere effettuate a braccia aperte o chiuse. Françoise Mézières’ (1909–1991) career as a physiotherapist and a teacher of anatomy/physiology changed radically following an empirical discovery (i.e. based on observation). With this primary discovery she found the clue to all our deformities, developed a powerful therapeutic tool for our musculoskeletal dysfunctions and pains, and formulated totally new biomechanical laws. Single-handed and single-minded she dared to question the theoretical basis of physiotherapy, orthopaedics and most forms of bodywork. 1947 was the year of the French revolution for the world of manual therapy. During this year Mézières’ made what could be considered, in the field of bodywork, the greatest discovery of the 20th century. Her primary discovery was so contrary to orthodox teachings that she spent two years trying to prove herself wrong. But her findings were real, not a mere illusion. The following years were rich in new observations she could turn to practical use. She went back to the study of anatomy, a subject she had been teaching for ten years. It took her twenty years to thoroughly check the validity of her observations and to understand the bodily mechanisms brought to the fore. An entirely new, unique and revolutionary method of diagnosis and treatment was born. This method, which bears her name, is based on perfectly well ascertained facts. No specialist could fault Mézières’ findings. Nevertheless she had to face fierce opposition because working her way meant that one had to abandon a paraphernalia of clever but useless machines. The panoply of corsets, braces, shoe inserts, traction tables, laser and ultrasound machines becomes obsolete when one adopts the Mézières’ approach. Also, her work is tiring and difficult because when only one part appears to require care it is necessary to treat the whole body. The sessions are long and on a one-to-one basis, they demand sustained attention and physical effort from the therapist because the Muscular Chains (MCs) resist with force and cunning any stretching attempt. The treatment of a particularly misshapen patient was the occasion that started the radical change in Mézières’ work. In the spring of 1947 Mézières’ examined a new patient: a tall, skinny woman in her forties, with a seriously round back (kyphosis). Suffering from back pain for two years, her whole torso had been caged up into a brace that did not stop her deformations but gave her plenty of bruises. The patient complained particularly about her shoulders: they are so painful that she could not lift her arms any more and therefore could not work. Mézières’ asked her to undress and to lie down on the floor. To flatten her patient’s back Mézières’ pushed on her shoulders but this attempt provoked a big concavity (lordosis) in the lower back of the patient. To counteract this unwanted hollow Mézières’ decided to lift the knees of the patient to tilt the pelvis back and flatten the lower back. But now it was the neck that presented a phenomenal concavity with the head thrown far back, and Mézières’, however hard she tried, found herself incapable of reversing this situation. the back muscles were behaving like a single muscle. Repeating the manoeuvre Mézières’ was forced to accept the fact that the concavity (or lordosis) is not fixed in one place but moves, like the bubble in a spirit level, according to the relative positions of the different parts of the body. Mézières’ believed, like all of her colleagues, that deformities are caused by weakness of muscles that become incapable of supporting the spine in its proper shape and of counteracting the force of gravity. In spite of these beliefs she decided to work paradoxically: to lengthen the back muscles; to deal with the hollows and to ignore the bumps. She treated her patient as if she was suffering from a total lordosis. After eight months of weekly sessions, only treating the concavities, Mézières’’ patient got rid of her brace and pains; became taller; lost her protruding stomach without any abdominal exercises; and, as she could now use her arms again, went back to work. With her new outlook on the practise of physiotherapy Mézières’ realised that this patient was not an exception. Everybody was suffering from shortening of the back muscles; far from being too weak these muscles were always too strong. After two years spent in experiencing and studying, Mézières’ drew six biomechanical laws. First law: the numerous posterior muscles (situated at the back of the body) behave like a single muscle. This is so because 97% of the posterior muscles are, in a large majority, multi-joint muscles (they extend over a minimum of two joints), and are overlapping like tiles on a roof. Mézières’ named this special anatomical arrangement “Muscular Chain” (MC). There are four MC in our bodies. The main one is the posterior muscular chain, running from head to toes. Nowadays, following the success of the Mézières’ method, many therapist have jumped on the “chain” bandwagon and we hear of articular chains, fascias chains and even of muscular chains that are made of contiguous muscles. The latter cannot fit Mézières’ definition of a MC where the muscles must be overlapping to ‘behave’ the way they do. Second law: they (the posterior muscles) are too short and hypertonic (too strong). Third law: any localised action, either of lengthening or shortening, results in the immediate shortening of the entire posterior musculature. The second and third law ensue from the first one. Because the muscles belonging to a MC are closely knitted together they are especially strong since the tone of each muscle adds up to the tone of all the others. Moreover their action is predominant in all our movements; contrariwise they never get the chance to be fully lengthened in our daily activities. MCs shorten and stiffen immutably during our life, shortening our stature, twisting and distorting us in a thousand ways – the cause of a multitude of pains, from frozen shoulder to sciatica. If you stretch or shorten a part of a MC the entire chain will shorten. This is because the change in length of an element of a MC will pull on the insertion of the following element, and so on until the end of the chain. Any partial lengthening is negated by a shortening of the entire MC. For this reason all forms of localised work must be completely ruled out. Fourth law: any attempt to resist this shortening provokes, instantaneously, latero-flexions (bending sideways) and rotations of the spine and limbs. Multi-joint muscles can have two or three actions. Within a MC these actions take over from one another. If the posterior MC is not lengthened in its totality, taking care to suppress all compensations, the shortening finds ways to escape the stretch. Fifth law: the limbs always rotate internally (i.e. they turn inwards). The muscles that turn the limbs inwards are stronger than the one that turn them outwards. Bow-legs and knock-knees are two different effects of the same cause, namely, the shortening of the posterior MC. In both cases the knees are turned inwards even if they sometimes give you the illusion of the contrary. Flat feet, a blessing for shoe inserts-mongers, are simply the result of these inwards turned knees which make the feet roll in. Sixth law: any stretch, untwisting, pain, concentration, effort, makes the patient hold his/her breath and fix the rib-cage into a position of inspiration. Holding the breath in inspiration is the ultimate compensation. 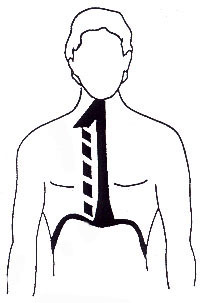 The diaphragm, the main breathing muscle, is part of a MC and, as such, tends to be unduly contracted. With its fellow members of the antero-inner chain (on the front and inside the body) it arches the spine forward and gives a fixed point to the back muscles which can hold on it and thereby reinforce their shortening. This is why the Mézières’ method focuses on the breathing out phase and never uses breathing in as a therapeutic tool. …we were absolutely convinced of the correctness of the orthodox principles according to which gravity was the enemy number one. (These are Mézières’ words, expressing her surprise when she discovered that the posterior muscles were betraying an excess of tone. According to orthodox view gravity is the main cause of our deformations and the posterior muscles are believed to be too weak to counteract the gravity force. Her primary discovery made her question this certainty and then reject it as a fallacy). To align the trunk. The shoulders are free but the spine is outstretched in an effort of maximum axial lengthening, active and assisted. Work on pelvic torsion. Local intervention within a total strectching posture, from head to hands and head. We all possess four muscular chains that are constantly shortening and increasing their tone. Muscle tone is a normal state of partial contraction of a resting muscle. Hypertonic (demonstrating an abnormal increase in tonicity), muscles in our MCs exert a permanent pull on their insertions. They act like a brake and we lose our flexibility and suppleness. During a lifetime this can lead to serious pathologies: joints put out of true; compression of intervertebral discs, leading to protruding or herniated discs; inflammations of soft tissue such as tendinitis and bursitis; joint stiffness or contracture; fibrosis; injuries; arthritis; and many others. These pathologies are always associated with a departure from the normal shape. Right thoracic, left lumbar scoliosis. New awareness and body sculpting. The normal, natural shape is the one that has not been altered by the retraction of our MCs. It is also the most beautiful, harmonious and symmetrical one. Beauty is the external sign of health and fitness. Consequently beauty is not skin deep; it is, at the very least, muscle deep. Form is for the sake of function. Have you ever seen a square wheel? Obviously not because the square shape does not fit the rolling action required from a wheel. Beauty is a prerequisite to health. But the reverse is true: any departure from the normal shape, no matter how slight, has to be interpreted as pathological. This is because any distortion, even the slightest, will always cause, sooner or later, pain and dysfunction. Imperfect shape is often considered normal because it is common. Slight deteriorations don’t interest specialists but they always get worse until they become major deformities. Indeed, as W. R. Inge, a British churchman and writer, said: “We tolerate shapes in human beings that would horrify us if we saw them in a horse.” Bow-legs, knock-knees, genu recurvatum (back knees), flat feet, hollow feet, Hallux valgus, hammer toes, saddlebag thighs’, sway-back, round back, scoliosis, winged shoulder-blades, Dowager’s hump are not inherited. If they do tend to ‘run in families’ the fault is not in our genes but in our muscles. All deformities, other than those which are congenital or arising from mutilations and fractures, have a unique cause: the shortening of the MCs. The body is not made up only of muscles, but only muscles hold the key to our shape. Mézières’ designed an original and unique way of treating patients based on her discoveries. Instead of working on the dysfunction by exercising this function, Mézières’ restores it through a reshaping of the whole body. This is achieved by means of an eccentric static contraction of the MCs. In other words the chains are passively extended and then contracted without any possibility of shortening. By stretching the tight MCs, the strength of the weakened antagonist muscles (mainly the quadriceps and abdominal) improves automatically. Practically speaking the work is based on very precise postures in which all the segments of the body are carefully aligned. This requires the adoption of a paragon (model) of the perfect shape which Mézières’ found in classical Greek sculpture. These postures can look ridiculously easy and simple – until you are trying to hold them. They are tailor-made (no prêt-à-porter in Mézières’ work) and carefully constructed until all compensations are eliminated. It is, unfortunately, impossible to give a fair account of methodology because every case is different with the MCs misshaping the body in a thousand different ways and the stretching of these MCs provoking compensations specific for each patient. The work is very physical for both patient and therapist and requires cooperation between them both. The MCs defend themselves in turns, twists, bends, and kinks of all sorts. They have their own kind of wicked ‘intelligence’ and have many tricks to avoid our efforts to become fit, healthy and beautiful. Forward bending posture (touching the floor with the knees straight). This posture is used to diagnose the condition of the muscular chains. The uninterrupted line shows how it should look when the muscular chains have enough elasticity. The legs are at a right angle with the floor, and the contour of the back presents an harmonious convexity. The dotted line shows some of the distortions that can be caused by tight muscular chains: the spine presents concavities or areas of flatness, the head is pulled back and the knees are locked back. The forward bending posture is also used during the treatment proper. The heavy line shows the flexion of the knees to counteract the tendency to lock the knees (but, ideally, the knees should be straight), and the alignment of the spine where the skull, scapulae and sacrum are on the same plane. This posture proves to be too difficult for the majority of beginners who cannot sufficiently correct the compensations provoked by it. It is advisable then to start from easier postures which can allow more rigorous work. Gareth, a personnel manager, spent his childhood troubled with musculoskeletal dysfunction. He saw several specialists until he was 15. He was suffering with cramps in the calves and feet and because of so-called loose joints (hyper-elasticity) he could not do PE: the specialists said there was a risk of dislocation. (Hyper-elasticity is an illusion; nobody was ever too supple. This illusion is the crafted work of the MCs which, through compensations, gives the impression of suppleness. Suppress these compensations and you will only encounter stiffness). At the age of thirty Gareth started to feel twinges in his back that soon became pains. He saw a chiropractor for three years with only a palliative effect. In 1995 he was diagnosed with a herniated disc at L4. He had an epidural without success, then had to lay flat on his back for six weeks. He then tried physiotherapy with no more success. A scan showed two herniated discs and a disc protrusion. In April 96 Gareth underwent two discectomies. After four weeks of rest the pain was gone but the numbness never completely disappeared. In August 97 serious back pain, numbness and cramps were back with, in addition, a neck pain. Gareth came to me in September 97, as a last resort, to avoid a new operation. Figuratively as well as literally he was in a very bad shape. His head was tilted to the right, his left shoulder higher than the right one, and the right hip higher than the left. We had to work cautiously because of the pain and the damaged disc. Putting him in a position of hyper-correction (the opposite of his distortions) the pains vanished. Repeating this procedure we were able to tackle more difficult postures. I also taught Gareth the basics of good use with the Alexander technique. Gareth made remarkable improvements in a short time and the operation is not anymore on the agenda. If Gareth still has a lot to learn and a lot of flexibility to gain he is now a new man who walks tall and sits pretty, and who does not suffer from cramps anymore and who no longer suffers from agonising pains. ‘Scoliosis’ is a lateral curvature of the spine and ‘idiopathic’ is a highbrow term used to cover ignorance since it means ‘of unknown cause’. The discoveries of the MCs and their particular behaviour allowed Mézières’ to make a breakthrough into the ‘mystery’ of scoliosis. Katie is a fifteen years old girl with a right dorsal, left lumbar idiopathic scoliosis with a 41º curvature. Two years ago she and her mother came to me for a consultation. They were worried that the curve may increase to the point of needing surgical treatment and decided to try the Mézières’’ approach. At the beginning the work was rather difficult because Katie was trying too hard and compensations were all over the place. But Katie has a good brain and a positive attitude. She learned to be patient and soon her kinaesthesia was much improved. After six months of weekly sessions an X-ray showed that the curvature was reduced to 37º. But Kathy is a ‘fitness-aholic’ and, outside her sessions, trains too much, does not rest sufficiently, and exercises in a way that would make Mézières’ turn in her grave. Nevertheless her orthopaedic consultant expressed surprise that her curvature, instead of worsening, had stabilised and has now stayed stable for two years. Recently we were able to refine the postures, stretching the MCs even more, and Katie shows a new and promising improvement in her posture. • Drawings reproduced with permission from Le Manuel du Méziériste Tome I by Godelieve Denys-Struyf. Éditions Frison-Roche, Paris 1995. Posture represents the fine interaction between all the systems in the human body. In all daily activities, we receive information to produce movement and adjust our position in space. These stimuli are processed in our brain and developed as signals to which will act by creating the required action. At Marcoophysio, our experts in postural rehabilitation look at the various systems (musculoskeletal, nervous, endocrine, vision and hearing) and investigate how to improve their cooperation. The Mezieres Method is a revolutionary holistic method of postural re-education named after Francoise Mezieres, physiotherapist, who created it in 1947 after careful observations on the body mechanic. She realised that the muscles acting on the back worked as a single muscle, forming a sort of chain, which she described as a group of muscles joined together working as a unit, where the alteration of an element affects the whole chain function. An increased tension of the muscles can cause dysfunction and pain, leading to unbalance between the muscular chains. If the structure is unbalanced, the function will be secondarily disturbed. Postural re-education wants to achieve a postural change through the work on the muscular chains balance. 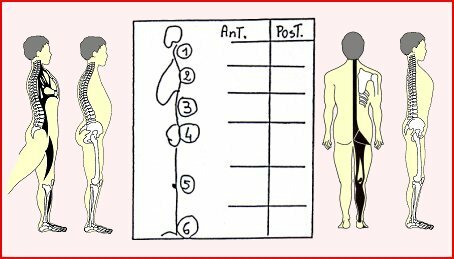 An accurate postural examination is required to understand where the cause of the dysfunction is hidden, frequently away from the frank area of pain. With postural re-education we can treat: chronic back pain, cervicogenic headache, developmental juvenile scoliosis, hyperkyphosis, hyperlordosis, vertebral disc injuries (herniation, protrusion, annular stra/post spinal surgery dysfunctions).